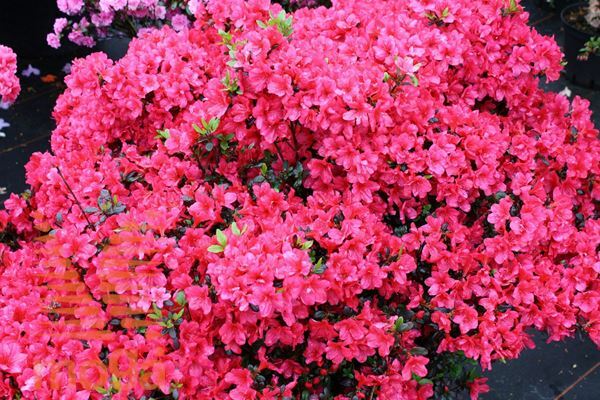 Rhododendron "Maruschka" ® Description azalea "Maruschka" Description Small, compact, slow growing evergreen shrub (H 0,5-0,7 m, W 0,8-1 m). Crown flattened spherical, broad, dense. Leaves ovate (2-4 cm), leathery, glossy, dark green, in winter dark coppery-red. Flowers very numerous, in dense terminal inflorescence, broadly funnel-shaped (3-5 cm), vivid carmine-red, with a darker red center. Flowering period: May-June, very freely flowering. Grows best in light, deep, fertile, acidic, humus-rich, sufficiently drained, but always moist soils, in a light semi-shade. Needs a sheltered position and some winter protection (mulch).